There is a real concern about what the future holds for RV dump stations. 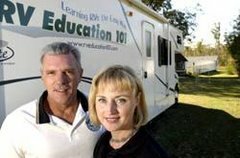 RV dump stations everywhere are closing down operation because of several reasons. 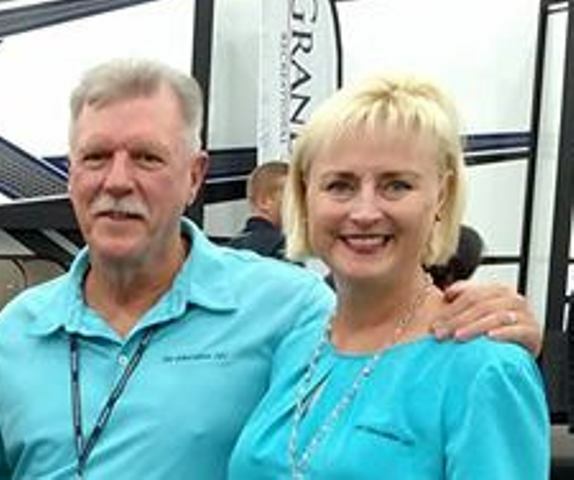 Some, but not all of these reasons are the costs and headaches involved to keep them operating and properly maintained, the wrong types of chemical treatments used by RVers, and because of neglect and poor housekeeping by RVers who use these dump stations. RV holding tanks are used to hold, or store waste water until a sewer system is available to empty the tanks. Because little water is used, in comparison to a domestic wastewater system, RV holding tank wastewater is far more concentrated. Adding to the problem are the chemicals required to assist in breaking down the waste and controlling odors. This requires more treatment than a regular house type waste system and it complicates the disposal of RV holding tank waste. In many cases it is much easier to just close the dump station. The problem that the average RVer is confronted with is how to control holding tank odors. Formaldehyde based chemicals do a better job of controlling odors. The problem with this is the organic strength from the mixture in an RV holding tank can be fifteen to twenty times stronger than a typical wastewater system. This leads to more complications for dump station owners. This problem is compounded when the RVer gets some odors from the holding tank and dumps even more chemicals in the holding tank in an attempt to control the odors. Environmentally friendly enzyme based chemicals use natural organic chemicals. They have a lower organic strength, which is better for the dump station but they don’t control odors as well as formaldehyde compounds. Note: There are inexpensive aftermarket products, like the RV-360, that effectively work to control holding tank odors. View the RV-360 installation video. Something else to consider is how much water you add to the holding tank when you use the toilet. Think about the toilet in your house. Even water saver toilets use about 1.6 gallons of water when you flush it, plus there is water in the bowl. The water level in your holding tank can help to control odors. You need to get in the habit of adding additional water to the holding tank whenever you flush the toilet. It is absolutely necessary that you keep the water level above the contents of the holding tank to assist in controlling odors and to prevent future holding tank problems. Another thing that I think happens frequently is that people don’t add enough water after they empty their holding tanks. You need to know what size holding tank you have and make sure you add enough water to completely cover the bottom of the tank each time you empty it. One RV holding tank might only need three or four gallons to cover the bottom of the tank where another one might need six or more gallons. It’s important that we do our part to make sure RV dump stations stay open and operational for the future of RVers everywhere. Here are five easy steps we can take to do our part. 1) Use plenty of water in the black water holding tank. 2) Use enzyme based holding tank chemical rather than formaldehyde based chemicals. 3) Use only the amount of holding tank chemicals recommended for the size holding tank you have. 4) Practice good house keeping every time you use a dump station. Imagine that you are the person that has to clean up behind everybody else. 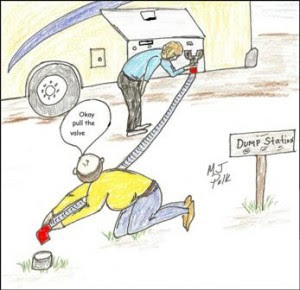 5) Never dump your holding tanks anywhere except in authorized dump stations and campground sewer systems.